The majority of people I've seen either ignore them or look at them confusedly and try to slap the three black dots - like a cat to a printer - to no avail. Obviously there are a lot of different kinds, ranging from old and busted to some having mini LCD screens - but only a few are actually press-able buttons. What's the deal with them? How do you use them? Simple answer - you don't. Unless you're blind, as that's who they are designed for. And given that your question started with "I see ..." I'm going to presume that you are, indeed, not blind! Their purpose is not to make the light turn green, but to allow a blind person to know when it has changed to green. For the longer answer, refer to this blog post which will give you all the details you could ever want. A lot of confusion (among Germans!) 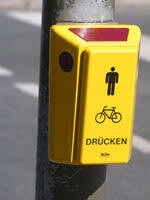 probably stems from the very similar and also yellow boxes that Germans have known for decades to be on some traffic lights which call for a green light for pedestrians (see image below). 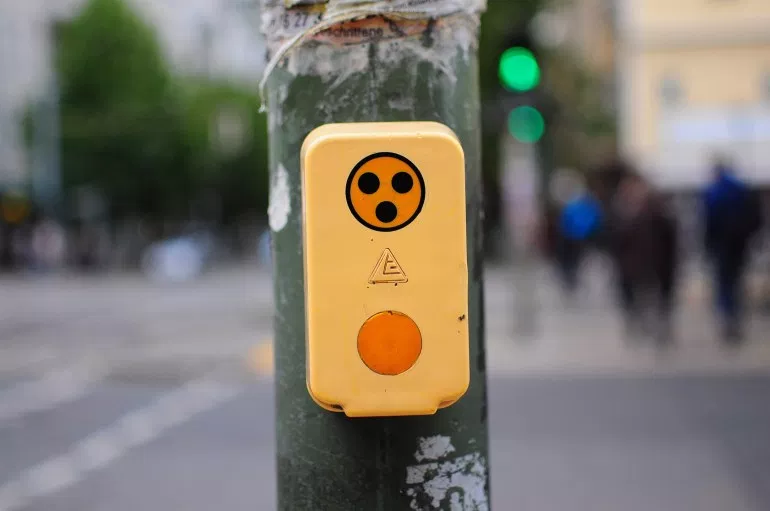 Once my child self had internalised that these should be pressed when you wanted to cross a road (if there was one of those boxes, the traffic lights would usually not grant pedestrians green unless pressed), I started doing it automatically whenever a yellow box of any type was fixed to a traffic light. Not the answer you're looking for? Browse other questions tagged germany berlin walking or ask your own question.